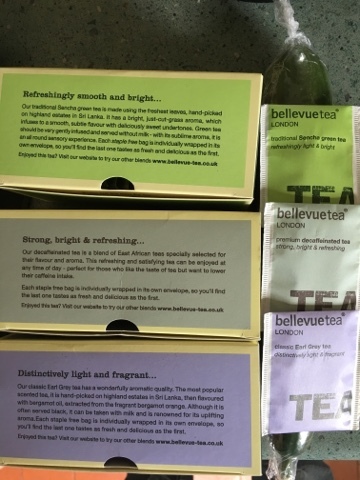 PR companies like to send tea. It's easy to post, and it's light. Unfortunately it's almost impossible to review without resorting to wine-taster cliches and directly comparing it to the tea you already love. 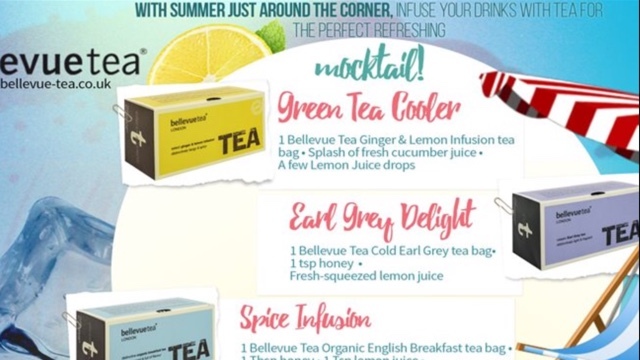 This presents a problem which Bellevue Tea have neatly sidestepped by inviting us to make tea based mock-tails. Non alcoholic cocktails are great. Their muddled flavours and often fruity base means you get all the best bits of drinking cocktails without the watered down spirits - you think the price is due to the alcohol, but it's really due to the queues at the bar using the blender makes. We were sent three varieties. Decaf tea tasted great and will be going to work for use as my afternoon tea once the decaf PG runs low. 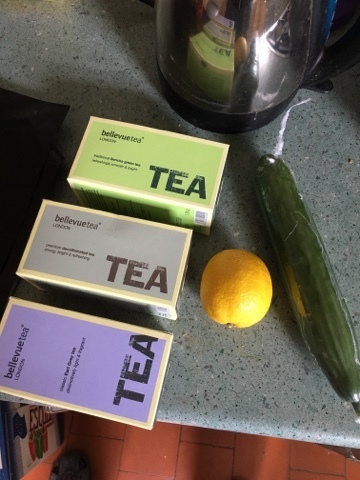 The green isn't quite to my taste (I drink a Jasmine green import tea) but it's a good one, and I'll be sharing this with colleagues who like their green without the floral notes. 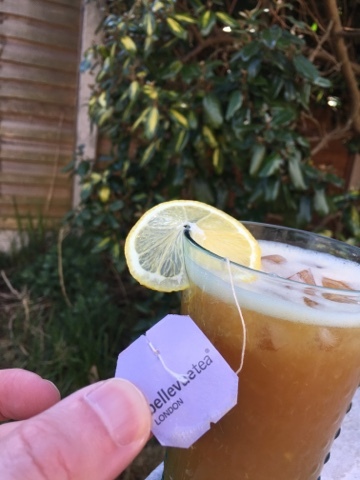 The earl grey is probably my favourite, the flavour is a shade different to the Wittards that is in my caddy at the moment. Without having two cups side by side I'd struggle to tell them apart - which is a kind of complement. Told you tea bags are hard to review! Here we have a dodgy screen grab of the cocktails menu (sorry - mocktails) that we shall be working on. You may have noticed the fruit purchases earlier. 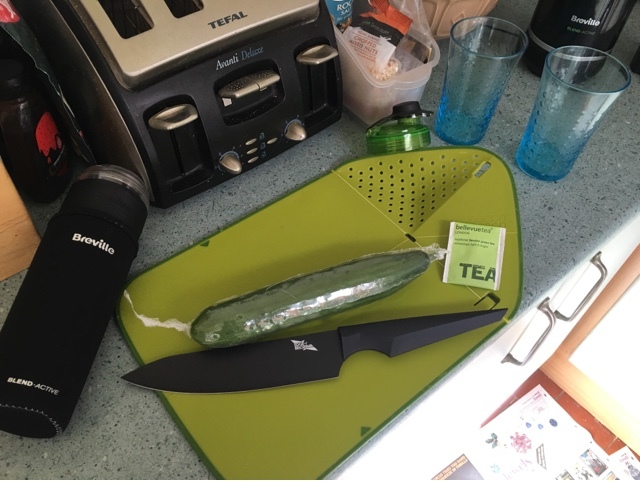 And boom - we have our cucumber juice (with bits because that's where the nutrition hides) to strain into the tea. ... Mix in the cucumber juice and we have a surprisingly professional looking drink. 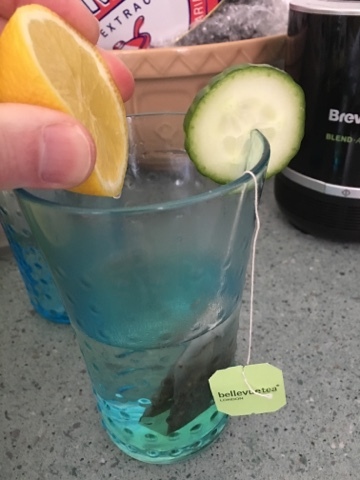 That tastes like cucumber water. 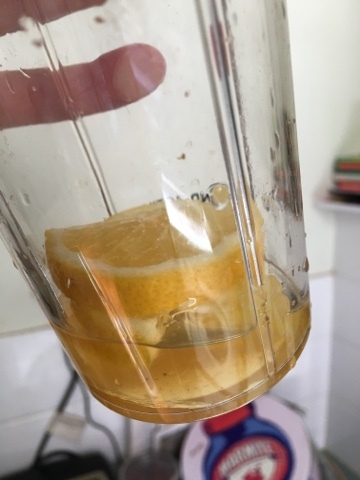 I added more lemon and the flavour perked up a bit, but it still didn't taste right. It was then I spotted that the teabags on the poster were lemon and ginger, and ours were plain green. Oops. I added even more lemon and a dash of ginger. Much to my surprise this did actually fill in the flavour curve nicely and it became a (weakly flavoured) refreshingly light drink. 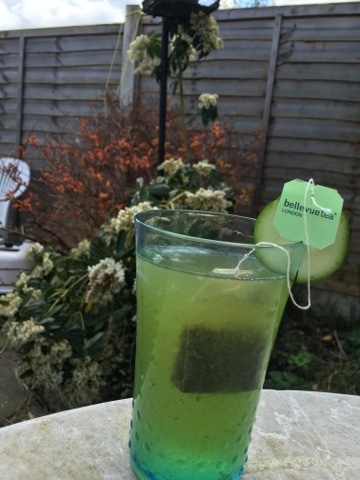 Regular readers will know I like my flavours large and strong and for me I think I should have brewed the tea a lot more before mixing it in - as I made it in a glass I let the water cool a little first. So for the second one I brewed my Earl Grey properly. We have a substitution here, the agave syrup that I have on my Weetabix is basically honey so I went for that. Lemons were chopped and peeled with one whole slice going in the blender for texture. Note the hot earl grey brewing away nicely. Also makes it look like lemon and honey in the picture too. 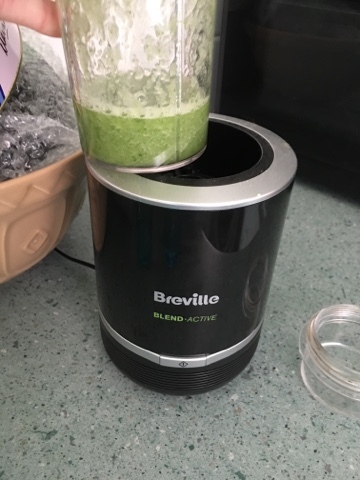 I put the tea into the blender with the lemons and agave and produced a drink that I'd have happily paid money for in a cafe. Sure - it was probably a bit too lemony (!) but it's certainly a spohisticated little number. 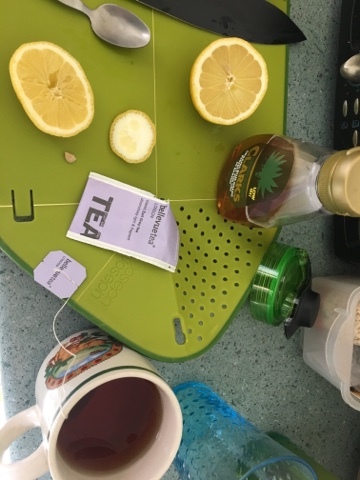 I'd have never thought of just grabbing a lemon, a tea bag and my blender to make a summer drink. I'm not sure why - I have a Happy Lemon loyalty card now - but I always assumed it would be more effort. I'm sure I'll be cracking this out for those inevitable summer nights where my house is filled with my partners girly friends before they head out and I'm sure I could make a lovely Lady Grey pitcher for them to sample with these ideas.